Electrical & Lighting 3 Prong plug for use on 15A/125V outlets.Replacement for 16/3 extension cords. Heavy duty plastic body resists impacts and wear. PREMIUM QUALITY - Made up of high quality materials that is proven and tested for its durability and functionality. 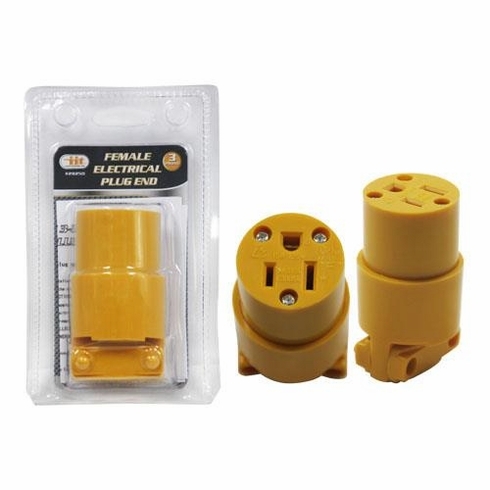 These heavy duty and durable End plugs has Heavy duty plastic body resists impacts, wear abrasion, moisture, dust and keep dirt away from important points of contact. It also secures wires from pulling out. SUPER SAFE - This will be a must have tool in your home garage, and office to replace those worn electrical cords with a much more safer end plugs. This can save lives and keep you safe. Electrical cords that are wear or torn is very dangerous, it can cause fire and electrical shocks. By using these end plugs, you can prevent any accident involving your worn or broken cords or plugs. Plus these end plugs is made up of safe and premium quality materials. 3 prong Electrical End plugs are ideal for 15A/125V in home, office, garage and many more. This is perfect for appliance cords, extension cords, and replacement of end plugs.